5 Medical ID wallet cards, IDWC01 (3 1/2" x 2") is a good compliment to traditional Medical ID jewelry. In some cases Medical ID plate cannot consist all information you would like to have. In such situations patients add a phrase: "SEE WALLET CARD" on ID plate. 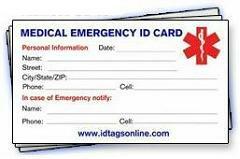 Also, Medical ID wallet card is beneficial for information, which is likely to change often. Replacement of wallet card is less expensive than stainless steel bracelet plate.